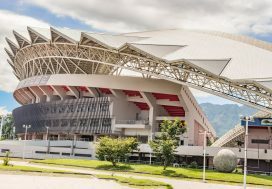 A visit to Costa Rica will be full of surprises. You’ve never seen white sand beaches like the ones we have here. 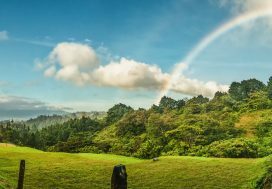 You’ve probably never seen such colorful sunsets, exotic jungle animals, or gushing waterfalls as the ones you’ll experience in Costa Rica either. And you’ve definitely never seen some of these local market fruits. Costa Rica is home to over 4% of the entire world’s biodiversity, so it’s no surprise that locals have a much wider variety to their diet than does much of the world. 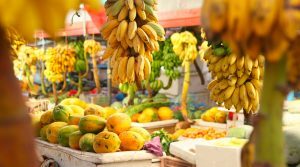 Exotic fruits and vegetables are sold on street corners for just pennies and much of the high-priced superfoods available in the United States are imported from this region, where they’re available fresh, unprocessed, and for just a fraction of the price. While your vacation itinerary is probably already jam-packed with exciting adventures, don’t forget to add a trip to the market to your list. This will be a highly cultural activity and you may just find a new favorite fruit. Many repeat visitors to the area already understand the variety of natural produce available and hold a taste-test party as one of their most anticipated afternoons. Head to the local market in your town and pick up anything you don’t recognize. You can cut them open later in the day and enjoy a beach-side taste-testing along with some local beers. You’ll experience the flavors of Costa Rica and possibly find a new favorite smoothie pairing. To get your taste-testing event started, we’ve compiled a list of 7 fruits from Costa Rica that you’ve never even heard of. 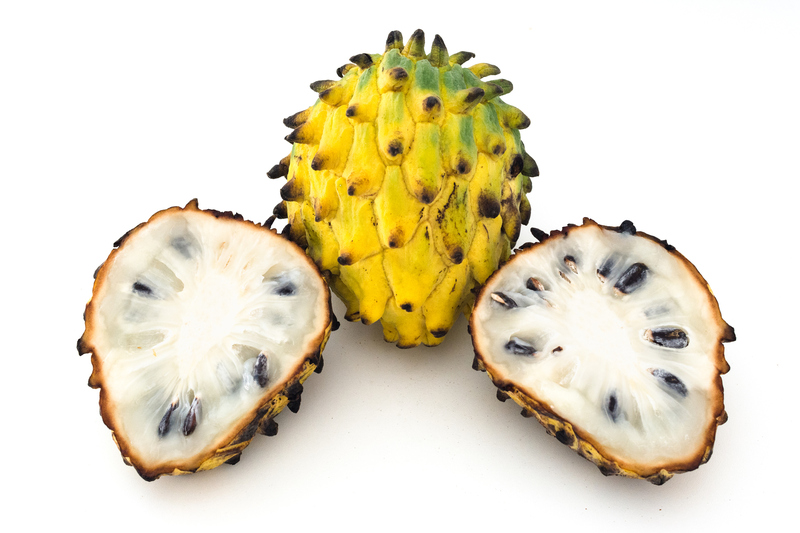 Locally, this fruit is called the biriba, but if you’re looking for any information online, you might want to search under “wild sugar-apple.” This fruit is actually native to the most southern parts of the Americas, but tends to grow successfully in the Central Valley of Costa Rica as well. The biriba is an odd looking, spikey fruit that is green when young and ripens into a yellow color. Once ripe, it can be broken open and eaten raw. The pulp of this fruit is extremely soft and sweet, and many people describe it as having all the flavors of a lemon merengue pie. There are many different species though, so the sweetness will fluctuate as your tour the region. This enjoyable fruit has a shelf life of just a few days, which is why it’s almost impossible to export. It grows quickly and spoils even more quickly, so your only chance to try it may be when visiting the region. Locally, chefs still don’t use this fruit very often for cooking, as locals prefer it raw. In Brazil, however, it has been used as an ingredient in main-course meals and as a base for a biriba wine. If you enjoy this fruit, you might try getting creative and seeing what meals and sauces you can make. Locally, this strange fruit is called “guanábana.” It’s another spikey, green fruit that will fit in the palm of your hand. 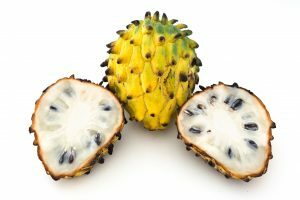 Although the flavor is typically described as a delicious mixture of pineapple and strawberry, with the creaminess of a coconut, it’s actually not very commonly sold in local supermarkets. One reason for this is that the tree grows so wildly that most people have access to the fruit for free, either in their backyards or from someone nearby. If you want to try it, however, you’ll be able to find at least one vender in your local market. Regionally, this fruit is considered a superfood. It’s believed to promote healthy cell growth and very effectively prevent cancer. Although not enough scientific studies have conducted to either prove or disprove this theory, it’s still an easy and delicious way to care for your health. This fruit is so little-known that there isn’t yet an English translation. The pejibaye is prolific along the Caribbean coast of Costa Rica and grows from palm trees. Pejibaye grows in large bundles, each fruit no bigger than a cherry tomato. They range in color from yellow to red and are the favorite snack of many local birds. A single tree will bear fruit for up to 75 years, and although there is a huge range of variety in this one fruit type, the product is extremely nutritious. The Pejibaye might be the most difficult fruit to find during your time in Costa Rica. Not only is it difficult to harvest, but it needs to be boiled for hours before humans can enjoy the flavor. Ask around in your local market and see if you hit gold. A granadilla might look like a small, circular orange from the outside, but once broken open, there’s no mistaking this unique fruit. The inside is a blend of seeds and a gelatinous pulp, and it’s typically eaten with a spoon straight out of the halved fruit. A granadilla is a must-try during your time in Costa Rica, but we’re offering no guarantee that you’ll like it. 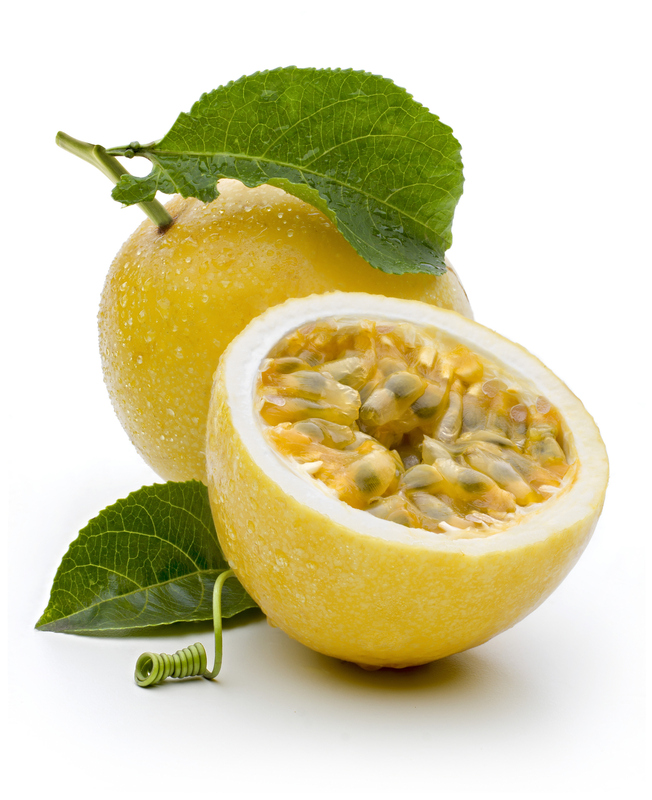 The pulp of the granadilla is extremely sour, somewhat comparable to a grapefruit. Locals often eat it for breakfast with either sugar or salt sprinkled on top. It’s also a popular on-the-go snack. Costa Ricans can buy this fruit for just pennies on any street corner. Split it open, slurp out the jelly-like pulp, and you’ll have enough energy to take on the rest of your afternoon. This is another fruit that you’ll probably only find when you’re visiting the Caribbean coast. This circular, brown fruit grows off a tree, and once split open, offers a orangish, sweet and malty fruit with three to four large black seeds in the middle. This is not a fruit that you’ll be able to find in your home countries, so trying one while you’re in Costa Rica could be a great experience. Make sure you find a perfectly ripe sapodilla, however, as the unripe ones have a chalky taste that quickly dries out your mouth. 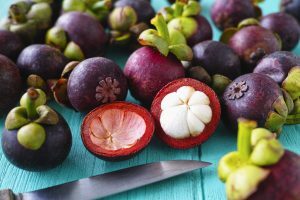 The purple mangosteen is a fruit that you’ve never heard of, and more likely than not, you’ve never seen anything like it either. Native to Indonesia and Southeast Asia, this fruit flourishes in Costa Rica, Puerto Rico, and a small part of Florida. This deep purple fruit opens to show garlic-like, white bulbs. Not commonly eaten, the mangosteen will most likely be served to you in the form of a tangy juice. The delicate texture and sweet, tangy, and slightly sour flavor makes it a favorite cooking ingredient in Southeast Asia, but it still isn’t used in many Costa Rican recipes. If this juice is enjoyable to you, you might have fun playing around with it in your favorite dishes. 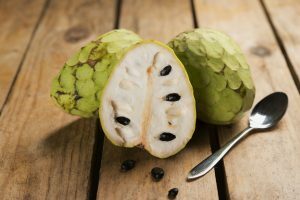 The Cherimoya first earned popularity with the Incan people, but when the fruit proved to flourish in nearly every corner of the tropics, it became an international favorite. Mark Twain described this fruit as “the most delicious fruit known to men,” and it’s popularly described as having an “apple custard” flavor with a smooth, creamy texture. The fruit is large, green, and looks strangely like an artichoke, which is why most new comers to the country ignore it completely, not ever realizing with a sweet fruit they have available to them. Once ripe, it will be broken open to show the creamy insides, so smooth it can be eaten with a spoon right from the fruit. In fact, a chilled version seems to be a popular treat in nearly every Latin American country. In Peru, it’s called the “ice cream fruit” and is used as a base in many ice cream styles. A couple chilled cherimoya thrown in your hotel refrigerator will be the perfect pick-me-up snack after a long day of hiking.